Adams Gerry, Falls Memories, Dingle, Brandon, 1982. – Cage Eleven, Dingle, Brandon, 1990. – Before the Dawn: an Autobiography, Londres, Heinemann-Brandon, 1996. Behan Brendan, Borstal Boy , Londres, Arrow, 1990. Boland Eavan, Object Lessons, The Life of the Woman and the Poet in our Time, Manchester, Carcanet Press, 1995. Bowen Elizabeth, Bowen’s Court, Londres, Longmans, Green and Co, 1942. – Bowen’s Court, Cork, The Collins Press, 1998. – Seven Winters : Memories of a Dublin Childhood, Londres, Longmans, Green and Co, 1943. – Bowen’s Court and Seven Winters : Memories of a Dublin Childhood, Londres, Vintage, 1999. – Collected Impressions, Londres, Longmans, Green and Co, 1950. – Afterthought: Pieces about Writing, Londres, Longmans, Green and Co, 1962. – Pictures and Conversations, Londres, Cape, 1975. – The Mulberry Tree. Writings of Elizabeth Bowen, Hermione Lee (éd. ), Londres, Virago Press, 1986. Carleton William, The Life of William Carleton; Being his autobiography and letters; and an account of his life and writings, from the point at which the autobiography breaks off, David J. O’Donoghue (éd. ), Londres, Downey and Co, 2 vol., 1896. – Préface à Valentine McClutchy, Dublin, James Duffy, 1847. Devlin Bernadette, The Price of my Soul, Londres, Pan, 1969. Heaney Seamus, Station Island, Londres Boston, Faber and Faber, 1984. Kavanagh Patrick, The Green Fool , Londres, Penguin Books, 1984. O’Connor Frank, An Only Child , Londres, Pan, 1970. McCourt Frank, Angela’s Ashes, New York–Scribner–Londres, Flamingo, 1996. –’Tis, A Memoir, New York–Scribner–Londres, Flamingo, 1999. MacNeice Louis, The Strings are False. An Unfinished Autobiography, Londres, Faber and Faber, 1996. – Collected Poems , Londres, Faber and Faber, 1979. – Modern Poetry. A personal Essay, Oxford, Clarendon Press, 1968. McStiofain Sean, Memoirs of a Revolutionary, Londres, Gordon Cremonesi, 1975. O’Brien Conor Cruise, Ancestral Voices, Religion and Nationalism in Ireland, Dublin, Poolbeg Press, 1994, p. 166. – (alias O’Donnell Donnat), Maria Cross, 1952. – Parnell and his Party, Oxford, Oxford University Press, 1957. – States of Ireland , Londres, Panther Books, 1979. – Memoir, my Life and Times, Londres, Profile Books, 1998. O’Brien Flann, An Béal Bocht, Áth Cliath, An Preas Naisiúnta, 1941 (illustrations de Seán O’Sullivan); Áth Cliath, Cló Dolmen, 1973. – The Poor Mouth : A Bad Story about the Hard Life, Patrick C. Power (trad.) et illustré par Ralph Steadman, Londres, Hart-Davis MacGibbon, 1973; Palladin, 1988. – Le Pleure-misère, André Verrier et Alain Le Berre (trad. ), illustré par Ralph Steadman, Paris, Le Tout sur le Tout, 1984. O’Crohan Tomas, An tOileanach (1929), The Islandman , Robin Flower (trad. ), Oxford–New York, Oxford University Press, 1951. O’Faolain Nuala, Are You Somebody?, Dublin, New Island Books, 1996. O’Faolain Sean, Vive Moi!, Londres, Rupert Hart-Davis, 1965. – And Again?, Londres, Constable, 1979. – Foreign Affairs, Londres, Penguin Books, 1986. – «A Portrait of the Artist as an Old Man», Irish University Review : A Journal of Irish Studies, vol. VI (1), 1976, p. 10-18. – «Principles and Propaganda», The Bell, June 1945. – «Signing off», The Bell, avril 1946. O’Sullivan Maurice, Fiche Bliain ag fas (1933), Twenty Years A-Growing , traduction de M. L. Davies, G. Thomson, Oxford, Oxford University Press, 1953. Patrick Saint, Confession, Ludwig Bieler (trad. ), in Gallico Paul, The Steadfast Man : A Life of St. Patrick, Londres, M. Joseph, 1959. Sands Bobby, Prison Poems, Dublin, Sinn Fein Publicity Department, 1981. – Skylark Sing Your Lonely Song : an Anthology of the Writings of Bobby Sands, Dublin, Cork, Mercier Press, 1982. – One Day in My Life, Cork, Mercier Press, 1983. Sayers Peig, Peig (1936), Peig : The Autobiography of Peig Sayers of the Great Blasket Island , Bryan MacMahon (trad. ), Dublin, Talbot Press, 1974. – Machnamh Seana mhna (1939), An Old Woman’s Reﬂections : The Life of a Blasket Island Storyteller, W. R. Rodgers (trad. ), Oxford, Oxford University Press, 1962. Yeats William Butler, Autobiographies, Londres, Macmillan, 1966. – Letters, Wade (éd. ), Londres, Rupert Hart-Davis, 1954. – «Some New Letters from W.B. Yeats to Lady Gregory», in Review of English Literature, Donald Torchiana and Glenn O’Malley (éd. ), juillet 1963. – Memoirs : Autobiography : first draft, Journal, Denis Donoghue (éd. ), Londres, Macmillan, 1972. – A Vision, Londres, T. Werner Laurie, 1925. – The Variorum Edition of the Poems, New York, Macmillan, 1957. – Essays and Introductions, Londres, Macmillan, 1961. The Field Day Anthology of Irish Writing, vol. III, Autobiographies and Memoirs, 1890-1988, Seamus Deane (éd. ), Derry, Field Day Publications, 1991. Seeking a Country: literary autobiographies of twentieth-century Irishwomen, Taura S. Napier (éd. ), Lanham, University Press of America, 2000. Northern windows: an anthology of Ulster autobiography, Frank Ormsby (éd. ), Belfast, Blackstaff Press, 1987. Eglinton John, A Memoir of AE, Londres, Macmillan, 1937. Ferrieux Robert (éd. 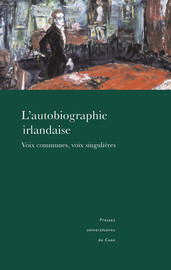 ), La Littérature autobiographique en Grande-Bretagne et en Irlande, Paris, Ellipses, 2001. Grubgeld Elizabeth, George Moore and the autogenous self: the autobiography and fiction, Syracuse, Syracuse University Press, 1994. Kenneally Michael, Portraying the self : Sean O’Casey and the art of autobiography, Gerrards Cross, Colin Smythe, 1988. Lowery Robert G., éd., Essays on Sean O’Casey’s Autobiographies, Londres, Macmillan, 1981. McHugh Roger, Harmon Maurice, Short history of Anglo-Irish Literature from its origins to th present day, Dublin, Wolfhound Press, 1982. Miller Liam, éd., Retrospect : the work of Seumas O’Sullivan, 1879-1958, and Estella F. Solomons, 1882-1968, Dublin, Dolmen Press, 1973. Ronsley Joseph, Yeats’s Autobiography; life as symbolic pattern, Cambridge, Harvard University Press, 1968. Wright David G., Yeats’Myth of Self : the Autobiographical Prose, Dublin, Gill and Macmillan, 1988. Ellipses, 2001, p. 251-266. – «Austin Clarke: Twice round the Black Church et A Penny in the Clouds», in La Littérature autobiographique en Grande Bretagne et en Irlande, Robert Ferrieux (éd. ), Paris, Ellipses, 2001, p. 227-246. Brown Terence, «Literary Autobiography in Twentieth-Century Ireland», in The Genius of Irish Prose, Augustine Martin (éd. ), Cork, Mericer, 1995, p. 89-98. Cardin Bertrand, «Autoportraits irlandais de la fin du xxe siècle : une langue sincère ou plusieurs voix trompeuses?», Voix et Langues dans la littérature irlandaise, Anne Goarzin et Stéphane Jousni (éd. ), Rennes, Presses Universitaires de Rennes, 2003, p. 141-150. Chaussinand Christelle, «Sean O’Faolain ou l’“identité espacée: Vive Moi!” », L’Autobiographie littéraire en Angleterre (xviie-xxe siècles), Géographies du soi, Frédéric Regard (éd. ), Saint-Étienne, Publications de l’Université de Saint-Étienne, 2000, p. 195-214. Deane Seamus, introduction to «Autobiographies and Memoirs, 1890-1988», in The Field Day Anthology of Irish Writing, vol. III, Derry, Field Day Publica­tions, 1991, p. 380-383. Fogarty Margaret E., «“It is myself that I remake”: The Shaping of Self in W.B. Yeats’s Autobiographies», in Critical Approaches to Anglo-Irish Literature, Irish Literary Studies 29, Michael Allen et Angela Wilcox (éd. ), Gerrards Cross, Colin Smythe, 1989, p. 75-85. Genet Jacqueline, «The Autobiography de Yeats : de la fragmentation à l’Unité», in La Littérature autobiographique en Grande Bretagne et en Irlande, Robert Ferrieux (éd. ), Paris, Ellipses, 2001, p. 279-304. Gaspari Fabienne, «Jeux de mémoire: Confessions of a Young Man et Hail and Farewell de George Moore», in La Littérature autobiographique en Grande Bretagne et en Irlande, Robert Ferrieux (éd. ), Paris, Ellipses, 2001, p. 305-318. Godring Maurice, «On the Land», in Pleasant the scholar’s Life : Irish Intellectuals and the Construction of the Nation State, Londres, Sherif, 1993. Grubgeld Elizabeth, «Class, Gender, and the Forms of narrative: The Autobiographies of Anglo-Irish Women», in Representing Ireland, Gender, Class, Nationality, Susan Shaw Sailer (éd. ), Gainesville, University Press of Florida, 1979, p. 133-155. Hugues Eamonn, «The political unconcious in the autobiographical writings of Patrick Kavanagh», in Critical Approaches to Anglo-Irish Literature, Michael Allen et Angela Wilcox (éd. ), Gerrards Cross, Colin Smythe, 1989, p. 103-110. Jacquin Danielle, «L’exil dans les autobiographies gaéliques des îles Blasket», in Irlande-Exils, Actes du Colloque de la SOFEIR, Nice, 20 au 20 mars 1998, Cycnos, vol 15, n°2, 1998, p. 99-110 – «Les autobiographies gaéliques; voix personnelle, voix collective, voix mythique», Études Irlandaises, vol 23-1, 1998, p. 13-26. Kenneally Michael, «The autobiographical imagination and Irish literary autobiographies», in Critical Approaches to Anglo-Irish Literature, Michael Allen et Angela Wilcox (éd. ), Totowa, Barnes and Noble, 1989, p. 111-131. Kiberd Declan, «Republican Self-Fashioning: The Journal of Wilfe Tone», in Irish Classics, Londres, Granta, 2001, p. 221-242. – «The Blasket Autobio­graphies», in Irish Classics, Londres, Granta, 2001, p. 520-542. Meir Colin, «Voice and audience in the early Carleton», Études Irlandaises, vol. iv (nouvelle série), déc. 1979, p. 271-286. Moya Carmela, «The Autobiographies as Epic», in Essays on Sean O’Casey’s Autobiographies, Robert G. Lowery (éd. ), Londres, Macmillan, 1981, p. 205-231. Napier Taura, «The Mosaic “I”: Mary Colum and Modern Irish Autobiography», The Irish University Review, vol. xxviii, n° 1, 1998, p. 37-55. Reilly Kevin P., «Irish Literary Autobiography: The Goddesses that poets dream of», Eire-Ireland : an Interdisciplinary Journal of Irish Studies, Morristown, the Irish American Cultural Institute, 3, 1981, p. 57-80. Yeats William Butler, «William Carleton», W.B. Yeats, Prose inédite, vol. III, Critique littéraire et artistique, John P. Frayne et Colton Johnson (éd. ), Jacqueline Genet et Élisabeth Hellegouarc’h (trad. ), Caen, Centre de publications de l’Université de Caen, 1990, p. 73-78. Amiot-Jouenne Pascale (éd. ), Irlande : Insularité, Singularité ?, Perpignan, Presses Universitaires de Perpignan, 2001. Anderson Benedict, Imagined Communities , Londres–New York, Verso, 1991. Aubert Jacques, «Introduction Générale», in James Joyce, Œuvres, Paris, Gallimard, (la Pléiade), vol. I, 1982. Beresford David, Ten Men Dead : the Story of the 1981 Irish Hunger Strike, Londres, Grafton Books, 1987. Boué André, William Carleton (1794-1869), romancier irlandais, Lille, Service de reproduction des thèses Université de Lille III, 1973. Brannigan John, Brendan Behan. Cultural Nationalism and the Revisionist Writer, Dublin, Four Courts, 2002. Brown Terence, Ireland – A Social and Cultural History – 1922-1985, Londres, Penguin Books, 1981. – Louis MacNeice : Sceptical Vision, Dublin, Gill and Macmillan, 1975. Campbell Brian, McKeown Laurence, O’Hegan Felim, Nor Meekly Serve my Time, The H-Block Struggle 1976-1981, Belfast, Beyond the Pale Publications, 1994. Chateaubriand François-René de, Mémoires d’outre-tombe, Paris, Gallimard (la Pléiade), 1951. Coogan Tim Pat, On the Blanket : the H-Block Story, Dublin, Ward River Press, 1980. Deane Eamon, Rittner Carol, Beyond Hate, Living with our Differences, Derry, Yes Publications, 1994. Deane Seamus, Strange Country : Modernity and Nationhood in Irish Writing since 1790, Oxford, Clarendon Press, 1997. Diers Richard, «On Writing: An Interview with Sean O’Faolain», Mademoiselle, vol. li (56), Mars 1963. Dowd Siobhan, This Prison Where I Live : the PEN Anthology of Imprisoned Writers, Londres, Cassell, 1996. Ellmann Richard, Yeats : The Man and the Masks, New York, Dutton, Everyman, 1948. Flower Robin, Irish Tradition, Dublin, The Lilliput Press, 1994. Friel Brian, Translations, Plays, vol. i, Londres, Faber and Faber, 1984. Genet Jacqueline, Fierobe Claude, La Littérature irlandaise, Paris, Armand Colin, 1997. – Studies on Louis MacNeice, Élisabeth Hellegouarc’h (éd. ), Caen, Centre de publications de l’Université de Caen, 1988. – Le Processus de la création chez les écrivains irlandais contemporains, Élisabeth Hellegouarc’h (éd. ), Caen, Presses Universitaires de Caen, 1994. Glendinning Victoria, Elizabeth Bowen, Hardmondsworth, Penguin Books, 1977. Goarzin Anne, Jousni Stéphane, Voix et Langues dans la littérature irlandaise, Rennes, Presses Universitaires de Rennes, 2003. Harris Eoghan, The Wealth of the Nation, the Necessity of Social Democracy, Research Section, The Worker’s Party, 1990. Hone, W.B. Yeats, Londres, Macmillan, 1942. Hoogland Renée C., Elizabeth Bowen. A Reputation in Writing, New York–Londres, New York University Press, 1994. Kearney Richard, Transitions, Narratives in Modern Irish Culture, Manchester, Manchester University Press, 1988. Kiberd Declan, Irish Classics, Londres, Granta, 2000. – Inventing Ireland , Londres, Vintage, 1996. Lloyd David, Nationalism and Minor Literature : James Clarence Mangan and the Emergence of Irish Cultural Nationalism, Berkeley, University of California Press, 1987. – Anomalous States : Irish Writing and the Post-Colonial Moment, Dublin, Lilliput, 1993. Mckeown Laurence, Nor Meekly Serve my Time : the H-Block Struggle 1976-1981, Belfast, Beyond the Pale Publications, 1994. – Out of Time : Irish Republican Prisoners, Long Kesh, 1972-2000, Belfast, Beyond The Pale, 2001. Mikhail E.H., The Art of Brendan Behan, Londres, Vision Press, 1979. Moore Brian, The Luck of Ginger Coffey, Londres, Flamingo, 1987. Ó Conaire Breandán, Myles na Gaeilge, Laimhleabhar an shaothar Gaeilge Bhrian Ó Nuailláin, Baile Áth Cliath, An Clóchomhar Tta, 1986. O’Connor Ulick, Brendan Behan, Londres, Abacus (1970), 1993. Pierce David (éd. ), Irish Writing in the Twentieth Century. A Reader, Cork, Cork University Press, 2000. Rabate Jean-Michel (éd. ), Beckett avant Beckett, Paris, Presses de l’ENS, 1984. Rafroidi Patrick, Brown Terence (éd. ), The Irish Short Story, Cahiers Irlandais 7/8,1979. Stallworthy Jon, Louis MacNeice, Londres, Faber and Faber, 1995. Tymoczko Maria, Translation in a Postcolonial Context : Early Irish Literature in English Translation, Manchester, St. Jerome, 1999. Ward Patrick, Exile, Emigration and Irish Writing, Dublin, Portland, Irish Academic Press, 2002. Anderson Linda, Autobiography, Londres, Routledge, 2002. Beaujour Michel, Miroirs d’encre, Paris, Seuil, 1980. Benstock S. (éd. ), The Private Self : Theory and Practice of women’s autobiographical writings, Londres, Routledge, 1988. Boelhower William Q., «The Brave New World of Immigrant Autobiography», Melus, vol. ix, n° 2, été 1982. Deleuze Gilles, Critique et Clinique, Paris, Minuit, 1993. De Man Paul, The Rhetoric of Romanticism, New York–Chichester, University of Columbia Press, 1984. Derrida Jacques, Otobiographies. L’Enseignement de Nietzsche et la politique du nom propre, Paris, Galilée, 1984. Freeman Mark, Rewriting the Self. History, Memory, Narrative, Londres, Routledge, 1993. Gusdorf George, La Découverte de Soi, Paris, PUF, 1948. – Mémoire et Personne, Paris, PUF, 1951. – «De l’autobiographie initiatique à l’autobiographie genre littéraire», Revue d’Histoire Littéraire de la France, LXXV, 1975, p. 957-994. Theoretical and Critical, James Olney (éd. ), Princeton, Princeton University Press, 1980. – Lignes de vie I : Les Écritures du moi, Paris, Odile Jacob, 1991. – Lignes de vie II : Auto-bio-graphie, Paris, Odile Jacob, 1992. Kerbrat M.C., Leçons sur l’écriture de soi, Paris, PUF, 1996. Koestler Arthur, Le Cheval dans la locomotive, le paradoxe humain, Paris, Calmann-Lévy, 1968. Kuperty-Tsur Nadine (éd. ), Écriture de soi et Argumentation. Rhétorique et modèles de l’autoreprésentation, Caen, Presses Universitaires de Caen, 2000. Lecarme Jacques, Lecarme-Tabone Éliane, L’Autobiographie, Paris, Armand Colin, 1997. Lejeune Philippe, L’Autobiographie en France, Paris, Armand Colin, (U2), 1971. – Le Pacte autobiographique, Paris, Seuil, 1975. – Je est un autre, Paris, Seuil, 1980. – Les brouillons de soi, Paris, Seuil, 1988. – «Autobiographie et récit de vie», in Le Grand Atlas des littératures, Encyclopaedia Universalis France S. A., 1990. – Pour l’autobiographie, Paris, Seuil, 1998. May Georges, L’Autobiographie, Paris, PUF, 1979. Olney James, Metaphors of Self : The Meaning of Autobiography, Princeton, Princeton University Press, 1972. – (éd. ), Autobiography, Essays Theoretical and Critical, Princeton, Princeton University Press, 1980. Pelletier Claude, Pudal Bernard (éd. ), Autobiographies, Autocritiques, Aveux dans le monde communiste, Paris, Belin, 2002. Regard Frédéric, éd., L’Autobiographie littéraire en Angleterre (xviie-xxe siècles), Géographies du soi, Saint-Étienne, Publications de l’Université de Saint-Étienne, 2000. Ricœur Paul, Temps et Récit III, Paris, Seuil, 1985. – Soi-même comme un autre, Paris, Seuil, 1990. Rosset Clément, Loin de moi. Études sur l’identité, Paris, Minuit, 1999. – Principes de sagesse et de folie, Paris, Minuit, 1991. Rousseau Jean-Jacques, Les Confessions, Œuvres Complètes, Paris, Gallimard (Pléiade), 1959. Rushdie Salman, Les Enfants de Minuit, Paris, Plon, 1997. Sheringham Michael, French Autobiography : Devices and Desires, Rousseau to Perec, Oxford, Clarendon Press, 1993. Starobinski Jean, «Le Style de l’autobiographie», Poétique, n° 3, 1970. Weintraub Karl, The Value of the Individual. Self and Circumstance in Autobiography, Chicago, University of Chicago Press, 1978. Zanone Damien, L’Autobiographie, Paris, Ellipses, 1996. Ashcroft Bill, Griffiths Gareth, Tiffin Helen, The Empire Writes Back, Londres, Routledge, 1989. Bachelard Gaston, La Psychanalyse du feu, Paris, Gallimard, 1949. Bakhtine Mikhail, La Poétique de Dostoïevski, Paris, Seuil–Pierres Vives, 1970. Barthes Roland, Le Plaisir du texte, Paris, Seuil, 1973. – Le Grain de la Voix, Paris, Seuil, 1981. – Le Bruissement de la langue, Paris, Seuil, 1984. Baudrillard Jean, L’Amérique, Paris, Grasset, 1986. Benveniste Émile, Problèmes de linguistique générale, Paris, Gallimard, 1966. Charles Daniel, Le Temps de la Voix, Paris, J.-P. Delarge, 1978. Collomb Michel (éd. ), Voix et Création au xe siècle, Paris, H. Champion, 1997. De Certeau Michel, L’Invention du quotidien : 1. Arts de faire, Paris, Folio, 1990. Derrida Jacques, La Voix et le Phénomène, PUF, 1967. – Marges de la philosophie, Paris, Minuit, 1972. Dessons Gérard (éd. ), Penser la Voix, Poitiers, La Licorne, 1997. Eliot T.S., The Complete Poems and Plays, Londres, Faber and Faber, 1969. Foucault Michel, L’Herméneutique du sujet. Cours au Collège de France 1981-82, Paris, Gallimard–Seuil, 2001. Genette Gérard, Figures III, Paris, Seuil, 1972. – Palimpsestes, la littérature au second degré, Paris, Seuil, 1982. Golgknopf David, The Life of the Novel, Chicago, University of Chicago Press, 1972. Lacan Jacques, Les Quatre Concepts fondamentaux de la psychanalyse, Paris, Seuil, 1973. Lévi Primo, Si C’est un homme, Paris, Juliard, 1987. Mathis Gilles (éd. ), Le Cliché, Toulouse, Presses universitaires du Mirail, 1998. Merleau-Ponty Maurice, La Prose du monde, Paris, Gallimard, 1969. Samoyault Tiphaine, L’Intertextualité, Paris, Nathan, 2001. Searle John, Speech Acts: An Essay in the Philosophy of Language, Cambridge, Cambridge University Press, 1969. Valéry Paul, Œuvres, Paris, Gallimard, 1957. Villani Arnaud, La Guêpe et l’Orchidée, Paris, Belin, 1999. Bibliographie In : L'autobiographie irlandaise : Voix communes, voix singulières [en ligne]. Caen : Presses universitaires de Caen, 2004 (généré le 22 avril 2019). Disponible sur Internet : <http://books.openedition.org/puc/743>. ISBN : 9782841334551. DOI : 10.4000/books.puc.743. Amiot-Jouenne, Pascale, (dir..) “Bibliographie”. Caen : Presses universitaires de Caen, 2004. (pp. 262-269) Web. <http://books.openedition.org/puc/743>.